I read this article and found it very interesting, thought it might be something for you. The article is called Falafel-Spiced Roasted Chickpea Salad with Tahini Dressing and is located at https://www.anediblemosaic.com/falafel-spiced-roasted-chickpea-salad-with-tahini-dressing/. Like spring cleaning for the house, I know quite a few people who do an annual detox every spring. I’ve done one for the past three years, usually around the beginning of April, but this year I’m a little late (yeah, oops). Being in Kuwait and having the weather already feel like the hottest part of summer back home, it just doesn’t feel like it’s time for a spring detox. But since the heat naturally drives me to eat veggie-based meals for most of my daily meals, I figure it’s not all bad. Adding exotic or seasonal fruit (like mango, coconut, or cherries), different seeds or nuts (think walnuts, cashews, or almonds), various kinds of beans (even roasted! ), whatever leftovers I have on hand, and/or switching up the dressing keeps salads interesting for me. Remaking something that isn’t salad (like falafel) into salad is always fun too. Last week I shared my recipe for Falafel-Spiced Roasted Chickpeas, which are perfect in this salad. Don’t skimp out on the dressing though! Tahini sauce is a classic pairing with falafel and I think it makes the salad. For the dressing, whisk together the tahini and lemon juice in a medium bowl. While whisking, add the water 1 teaspoon at a time until it reaches your desired consistency. Whisk in the salt and pepper. For the salad, arrange the lettuce on 2 plates; top each with half of the tomato, cucumbers, onion, and chickpeas. Sprinkle the sesame seeds on top and drizzle on the dressing. A wonderful salad! So scrumptious. I have a can of chickpeas that’s been sitting in the cupboard for a few weeks now–I think I’ll be getting use out of them this week now! Thanks for the Easter detox inspiration! This would be such a great lunch, I love the roasted chickpea topping! I wish I had all the ingredients to enjoy this yummy salad right now! I absolutely adore falafel. I love this twist on it with the falafel-spiced chickpeas. Yum. Falafel without the unhealthiness of frying the chickpeas is genius! 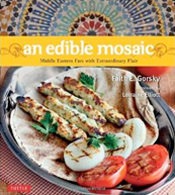 You’ve got me craving falafel now…I’ll have to try this soon.